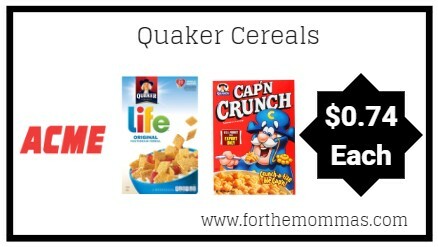 Acme: Quaker Cereals ONLY $0.74 Each Thru 12/13! Thru 12/13, Acme has a great deal on Quaker Life Cereals. It is priced at $1.99 each, plus we have $1/2 Quaker Products coupon and a ibotta rebate to use on this deal that will make the final price just $0.74 each. Note: Keep an eye out on the expiration of the Cap’n Crunch rebate.